The novel “The Dirdir” by Jack Vance was published for the first time in 1969. It’s the third novel in the Tschai tetralogy, also known with the global title “Planet of Adventure”, and follows “Servants of the Wankh“. Adam Reith’s attempts to find a starship to return to Earth and leave the planet Tschai have attracted the attention of the Dirdir, one of the species that inhabits Tschai. Along with his companions, he manages to kill the first group sent to capture him and kill him but he knows that others will follow. Reactint to threats and other events isnot enough so Adam Reith decides it’s time to turn the tables. On Tschai there are technologies to build a new starship but they really need a lot of money to do it. To obtain the money, the Earthling robs the Dirdir. In “The Dirdir” the adventures of Adam Reith continue in his attempt to leave the planet Tschai. The narrative takes up where was the second novel ended, with the astronaut who, after a series of adventures with his unlikely companions Traz and Anacho he devises a new plan to get a starship. In the course of his adventures, Adam Reith traveled in various regions of the planet Tschai, meeting some of the human cultures and even some of the other species that live there. 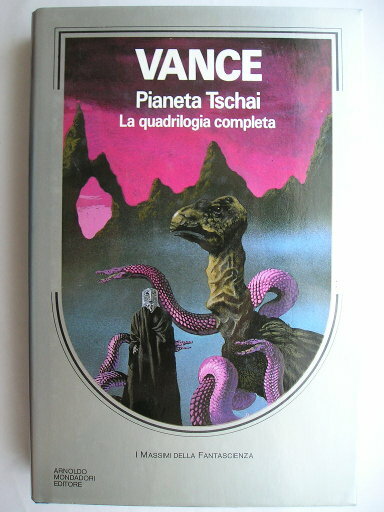 From this point of view, the first two novels of the Tschai tetralogy contain elements typical of Jack Vance’s works but something changes in “The Dirdir”. This time, Adam Reith and his traveling companions find themselves having to deal with the Dirdir, who have a hunting instinct that leads them to act ruthlessly and possibly quickly. For the Earthling the problem is no longer escape occasional dangers because now he’s wanted, a specific target. For this reason, “The Dirdir” is not a travel chronicle but in many ways the story of the clashes between Adam Reith and the Dirdir. The consequence is that compared to the previous novels there’s a sense of constant threat which is focused more on the Dirdir instead of being occasional and from local enemies. In his project to build a new starship, Adam Reith has to resort to the “special services” offered by one Aila Woudiver, who supplies him with technology and workforce. All this costs a lot of money, also because Woudiver is particularly greedy, but the biggest problem is that he’d like to be a Dirdirman so Reith can’t trust him. The very tense relationship between the two of them adds to the sense of threat existing in the novel. All this doesn’t mean that in “The Dirdir” you can’t see Jack Vance’s hand but only that the author focuses more on the Dirdir and some characters such as Aila Woudiver. The plot is used to provide information about their culture, their traditions and more such as their complex sexuality. They are very powerful enemies but also very individualistic and this is one of the few hopes for Adam Reith to survive. Like the previous ones, “The Dirdir” is a novel short even by the standards of the time bu Jack Vance always managed to put enough detail to make the story rich as well as enjoyable and interesting. This is the third part of a larger story and is closely linked to the other novels in the series is it has neither a real beginning nor a real end. For this reason, I think the best thing is to get the complete Tschai tetralogy to read it all and fully enjoy this classic not only of the planetary romance subgenre but of science fiction in general. Follow me on social media at the profiles listed in this page! This blog’s contents are licensed under a Creative Commons Attribution-NonCommercial-ShareAlike 3.0 unless stated otherwise. Copyright © 2019 NetMassimo Blog. Powered by WordPress and Stargazer.